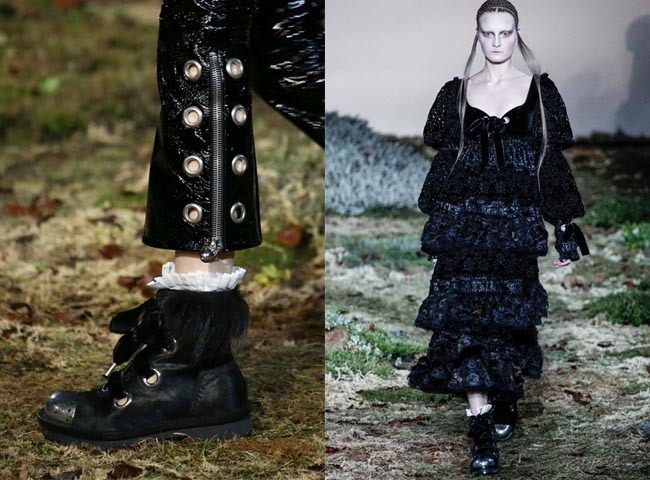 Alexander McQueen Fable Boot from their Autumn/Winter 2014 comes in two heights: ankle and thigh high and is available in an exciting range of fabrics and textures. They come in black grainy patent leather, black San Gallo laser cut embroidery or Swarovski crystal embellishment. All styles have a pleated cotton poplin trim, metal toe caps and are tied with velvet ribbon laces. Add some glamour to your wardrobe.